Vancouver, BC -- Aben Resources Ltd. (TSX-V: ABN) (OTCBB: ABNAF) (Frankfurt: E2L2) (the "Company") is pleased to provide a summary of exploration results from field work carried out in August 2017 on the 100% owned 18,314 acre Justin Gold Project in southeast Yukon. Highlights include the discovery of a new gold-bearing vein system (Lost Ace) that returned 4.77 g/T (grams/tonne) Au over 1.0 metre. The new Lost Ace zone is located 2 kilometres along strike from the POW Zone, an area that has previously returned drilled intercepts of 1.19 g/T Au over 60 m (including 2.47 g/T Au over 21 m) and 1.49 g/T Au over 46.4 m.
All samples were submitted to ALS Minerals ("ALS") in Whitehorse, Yukon for sample preparation. Geochemical analyses were completed at the ALS facility in Vancouver, British Columbia. The following analytical techniques were used for all samples: ME-ICP41, Au-AA23 30 g Fire Assay and Au-SCR21 30 g Metallic Fire Assay. The Company's QAQC measures included insertion of external blanks and standards into the sample stream for all rock chip and channel samples. A minimum of one standard and one blank sample was inserted for each trench. In addition, the lab was instructed to wet-sieve each sample prior to sample preparation in order to minimize contamination from overlying gravels. 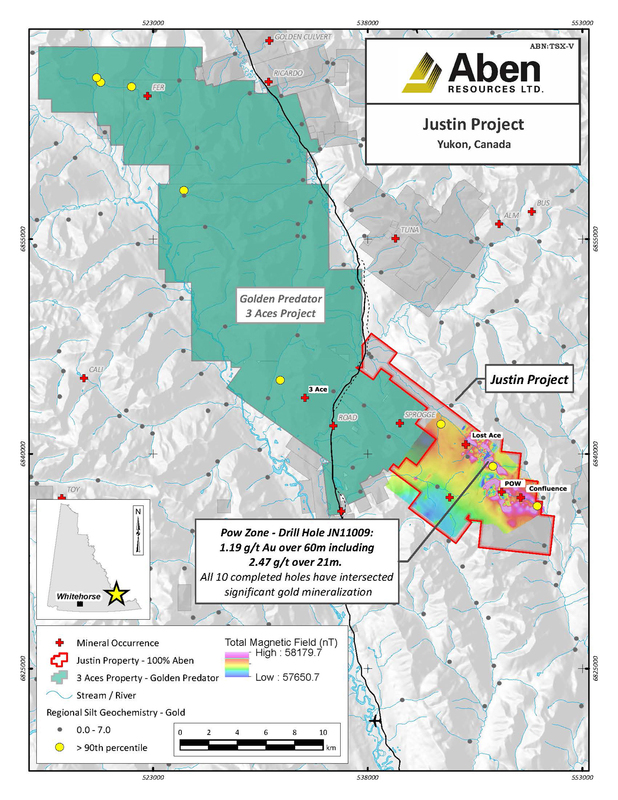 Aben Resources is a Canadian gold exploration company developing gold-focused projects in British Columbia, the Yukon Territory, and Saskatchewan. Aben is a well-funded junior exploration company with approximately 53.2 million shares issued and outstanding. For further information on Aben Resources Ltd. (TSX-V: ABN), visit our Company's web site at: www.abenresources.com.